One morning, while Jonathon Brae is fishing by the river, he spots a girl who looks different from anyone he has ever seen in the Valley. She carries a bow and arrows, has golden stripes in her red hair, and strangest of all, has blue eyes. When Jonathon realizes she is a Dalriada--one of the barbaric mountain people who have magnificent horses, mystical powers, and horns growing out of their heard--he runs away. Yet Jonathon is also different from the brown-eyed Valley folk. They say he will go insane when he turns fourteen because he too has blue eyes. 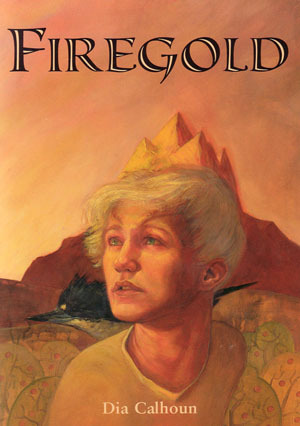 His parents, especially his father who is obsessed with finding the legendary Firegold apples, constantly evade his quesitons. Jonathon even begins to wonder if Brian Brae really is his father. He also wonders if the blue-eyed Dalriada girl will go insane--or can the Dalriadas use their magical powers to prevent it? Could the Dalriadas help him? But Jonathon fears them as much as he fears his future. When Jonathon is blamed for the blight destroying the Valley orchards, he escapes to the Red Mountains and searches for answers.